In celebration of my 25th anniversary of employment, my employer (Martinair) issued me tickets for a destination of choice; I decided to revisit a favourite corner of the world: Western Canada & Alaska. And I decided to aim for a few places I had not been before. The flight on board the Martinair 767-300ER to Calgary (June 08th) was uneventful; for my travel in the area I had opted for a combination of standby tickets and e-tickets booked through the internet (my plans had started very ambitious, which I had to scale down a bit for budget reasons and time available). Standby for Calgary to Seattle did not work out due unavailability of open seats; so after 4 hours waiting with disappointing result, we bought tickets with Westjet for Vancouver and rented a car to drive to Seattle the next day; that was a big hole in the budget from day 1...! 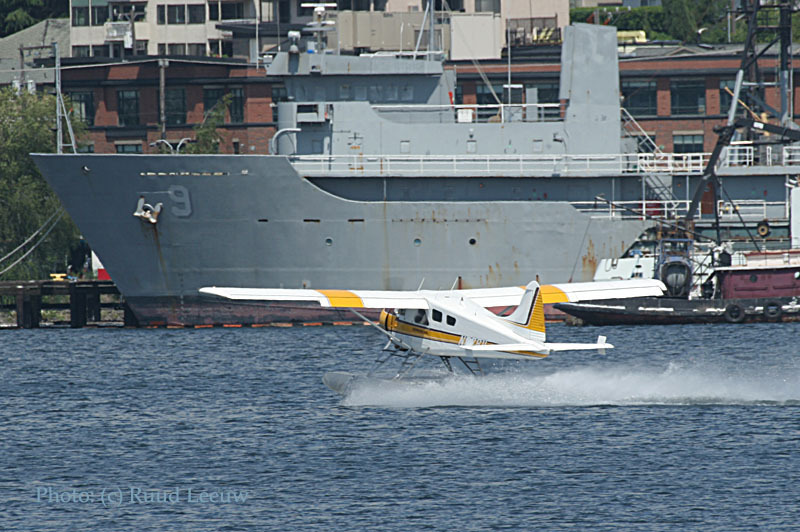 That first day we saw it pouring with rain, but driving south the sun began to shine and I decided to visit Lake Union in Seattle and witness some Kenmore Air floatplane action, to wash away the feelings of a false start. That is, after we visited an Outlet Store to placate my wife in anticipation for the many planes I'd set my mind to see! N1018U taxies in in order to unload a group of passengers. It is probably less than 20 minutes by cab from here to Sea-Tac Int'l Airport. N1018U has construction number 1381 and was manufactured by DeHavilland Canada in 1959. FAA has it registered to Westlake Marina LLC since 09Oct02. I had my mind set to see a lot more of these vintage bushplanes and I was looking forward to see so many of them fully operational. The DeHavilland (also referred to as de Havilland) Canada DHC-2 Beaver is one of the most (if not the most..) famous bush planes in the world. After World War II, de Havilland Canada was looking to produce a plane suited to operations in the rugged Canadian north. de Havilland hired veteran bush pilot Punch Dickins as their Director of Sales and after extensive consultation with pilots, they began production of the Beaver —a reliable, single-engine monoplane that could be easily fitted with wheels, skis, or floats. Over 1,600 Beavers were produced. The first flight of the DHC Beaver was 16Aug1947, with the first production aircraft being delivered in April of 1948. The plane was an immediate success within the Canadian aviation community, and when production finally ceased in 1967, 1,657 DHC-2 Beavers had been built. 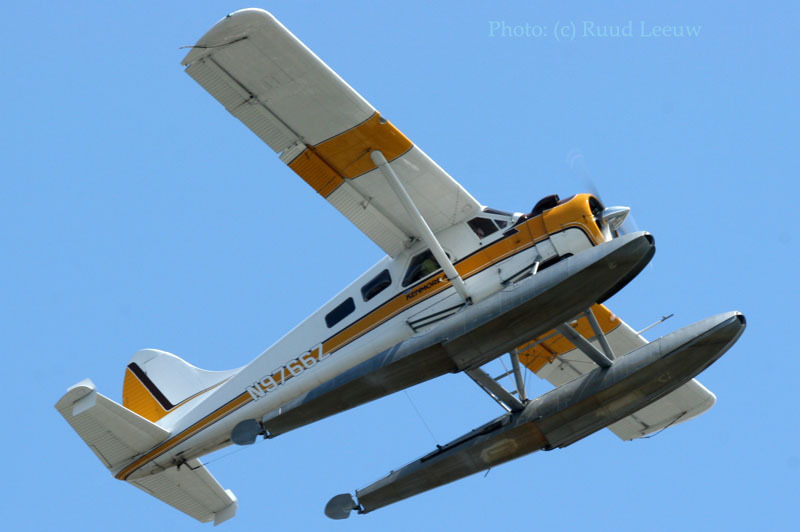 The Beaver has become a symbol of the Canadian north, and has since found use as a bush plane all over the world. 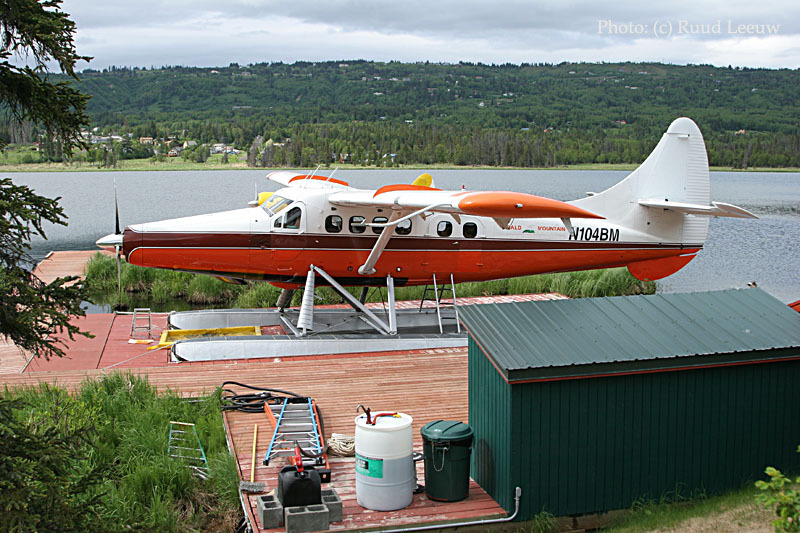 it was a constant coming and going of these vintage DeHavilland DHC-2 Beavers. N17598 is a DHC-2 Mk.1 with c/n 1129; it was registered to Kenmore Air 05Apr68, so one can label this Beaver a faithful servant! 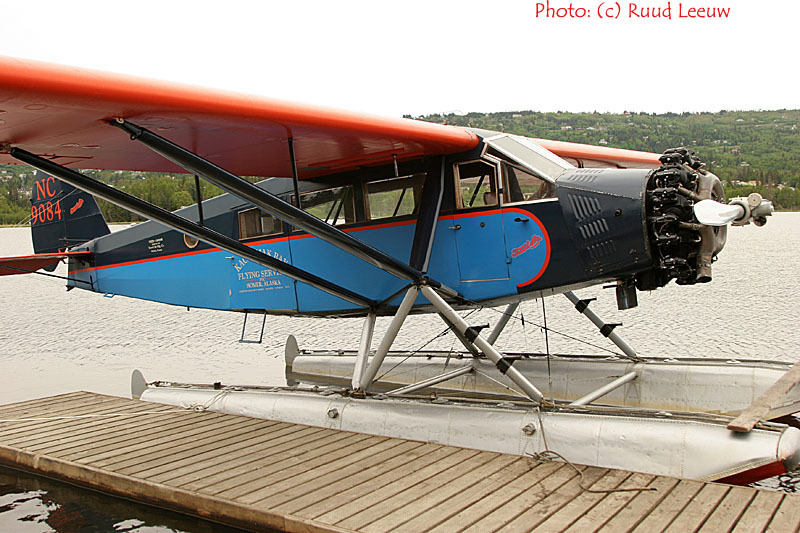 DeHavilland Canada produced this DHC-2 in 1958. It was a beautiful day to be on the water! Enjoying a short break here is c/n 788, presently registered as N6781L. It was delivered on 15Apr55 as 53-7964 to the US Army. It was stored at Davis Monthan from 27Mar72 to 10Mar76. Its commercial career began as N99837 for El Cajon Flying Service of Santee, CA, but I have no date for this. 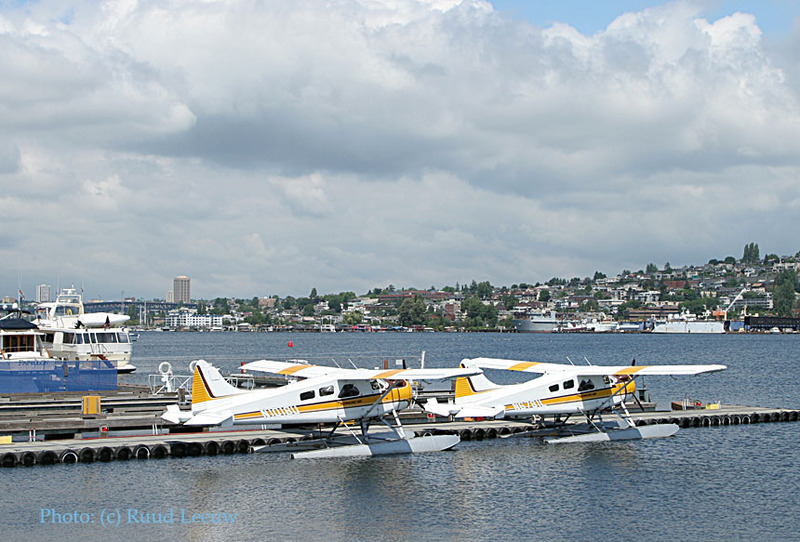 Later it became N10LU for Lake Union Flying Service Inc. of Lake Union / Seattle,WA. Climbing out here is c/n 504 with tailnumber N9766Z. It was delivered on 08Jun53 as 52-6121 to the USAF (type: L-20). Tailnumber N13454 marked its introuduction to commercial, being registered to Webber Air Inc but I have no date for this. 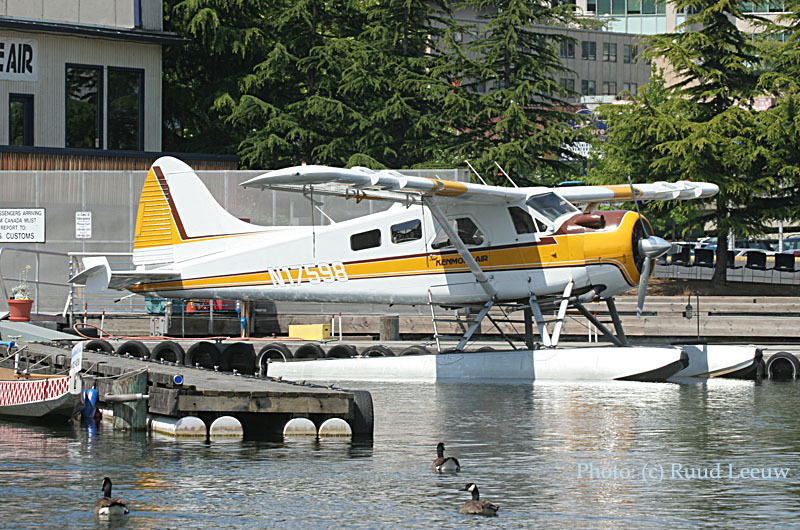 N9766Z was first assigned to Kenmore Air Harbor Inc. in ca. 1970. But it crashed on 04Oct99 at Winslow,WA; the aircraft was flying low for aerial photography when it stalled and struck trees… It sustained substantial damage; fortunately there were no fatalities. It was reported at Kenmore again in May 2001, fully restored and in great shape. The link www.warbirdalley.com/u6a.htm has information on the L-20 / U-6A Beaver, but also more interesting links and info on the best book on the DHC-2: Sean Rossiter’s "The Immortal Beaver". 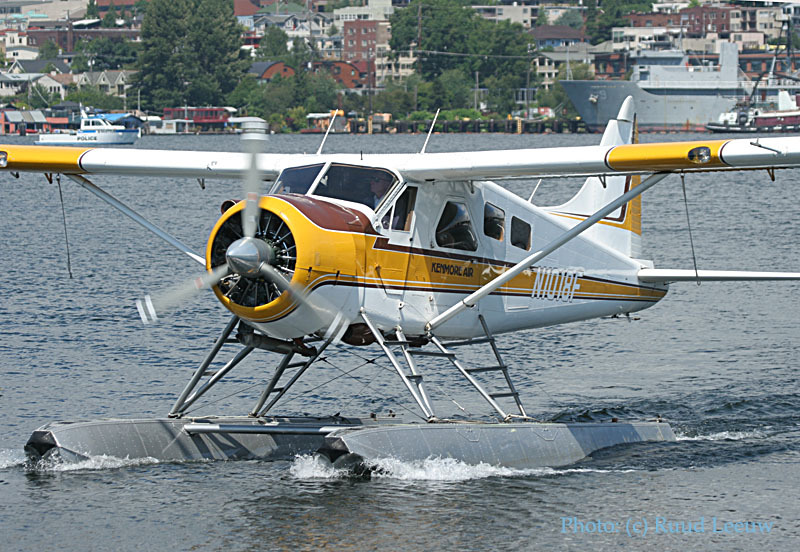 Kenmore Air zero-hours Beaver and Otter airframes and owns dozens of supplemental type certificates (STCs) for aircraft modifications. 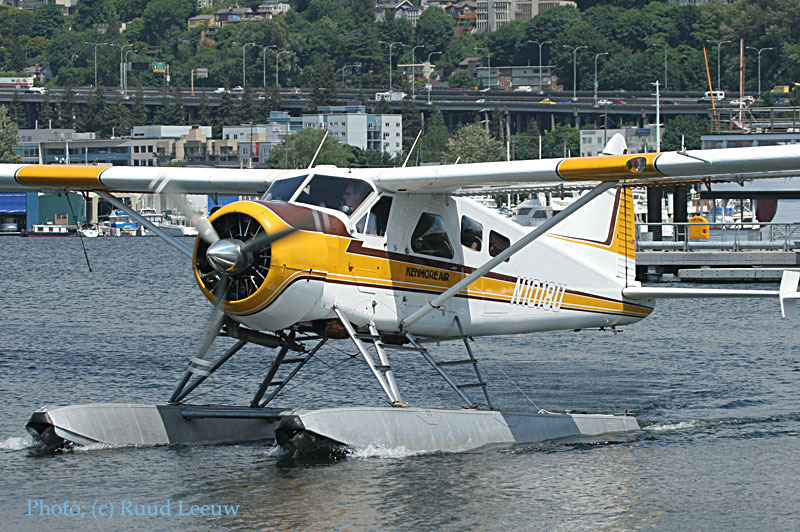 These modifications are so well-known and desirable in the aviation community that the rebuilt Beavers are often called "Kenmore Beavers" or listed as having "Kenmore mods" installed. A 1950s Beaver that originally sold for under US $50,000 can now be seen for sale at prices reaching US $500,000. AND THEY MADE A SONG ABOUT IT...IT IS GREAT !! The Fretless Bar Girls originally performed "The Beaver Song" at the deHavilland Beaver 50th Anniversary Conference held in Victoria, B.C. in October, 1997. Bill Alder at Sealand Aviation liked the song so much that he asked Annemarie Kock & Elizabeth Harvey, the Fretless Bar Girls, to record it for posterity. The Bar Girls can be reached at Box 286, Sointula BC, Canada; Their email address is "bargirls -at- north.island -dot- net"
Seen arriving with passengers is DHC-2 N1018F. C/n 710 was delivered on 19Oct54 as 53-7902 to the US Army. In 1980 it was registered as N1018G for Kenmore Air Harbor Inc.
A year later it went to Alaska Coastal Construction. Next, without a date, it went to Temsco Helicopters Inc. of Ketchikan,AK. Terry R. Wills of Ward Cove,AK became the next owner (date?). I have no dat efor the move to Group III Aircraft Inc. of Bellevue,WA. It was reregistered as N62SJ in Aug95. Disaster hit when it crashed on 02Sep95 at Blakey Island,WA. 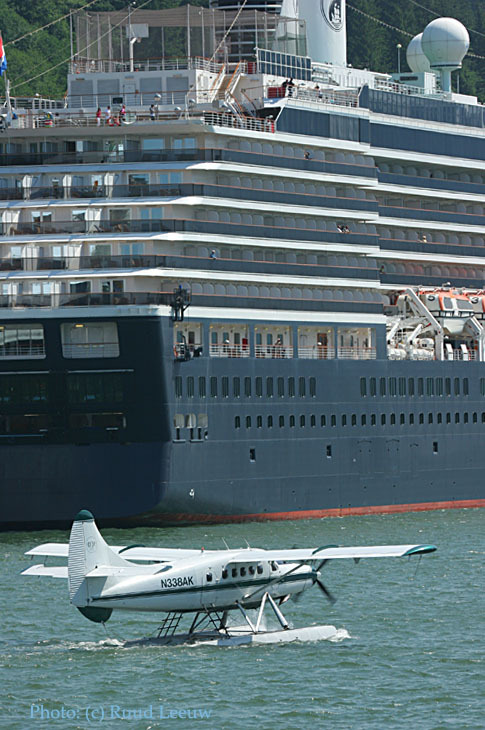 (read more on the NTSB Report: SEA95LA202). 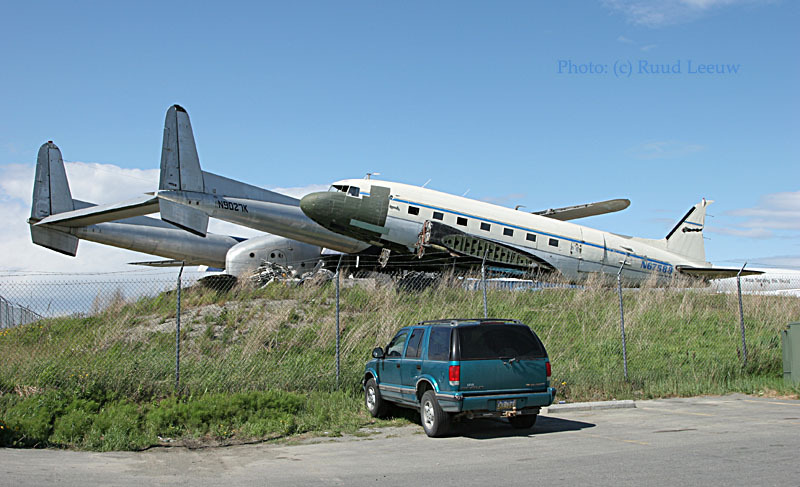 It was reported in Sep95 at Kenmore Air Harbor (Kenmore,WA) in wrecked condition; at that time there were no intentions to rebuilt it. But true to the Beaver’s immortality, it was restored and registered again as N1018F (a 2nd time this tailnumber was issued) for Kenmore Air Harbor Inc on 01Apr96. A truly fantastic book to read on aviation pioneering in general and Kenmore Air Harbor in particular, is the book written by C.Marin Faure (foreword by DHC-2 owner & driver Harrison Ford), "Success on the Step", subtitled 'Flying with Kenmore Air'. "We disassemble the plane completely, take everything out until all we're left with is the basic fuselage shell. We strip the paint and primer and dirt of everything and clean every single part. Then we overhaul all the components and believe me there are a lot of them.The fuel system, the hydraulic flap system, the flight controls, the elctrical system, the instruments, you name it, it gets overhauled or replaced. While the airplane's apart we make whatever modifications the customer ordered, put in the larger back window, move the battery up forward, stuff like that. If there's a damaged skin panel we either cut out the damaged part and rivet a patch over the hole, or we replace the entire panel with a new one we make in the sheet metal shop. The commercial operators who used to buy most of our Beavers were perfectly happy with patches because they were a lot less expensive to make. The wealthy businessmen and celebrities who buy our Beavers today usually want the entire panel replaced because it looks better. Then everything that needs painting before it's put back in gets painted or corrosion-proofed. Then we put the plane back together and paint it. It all sounds pretty simple when you describe it this way but it takes 3.500 man-hours or more to turn out an airplane with the kind of quality we want in it." 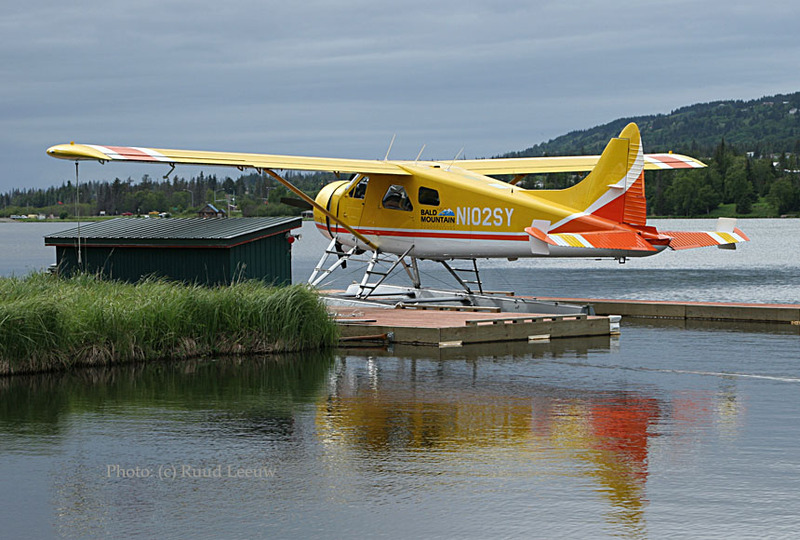 That is how Kenmore Air Harbor has earned the reputation that you can walk in with a bolt that once fell off a Beaver, and Kenmore will build a plane around it..! 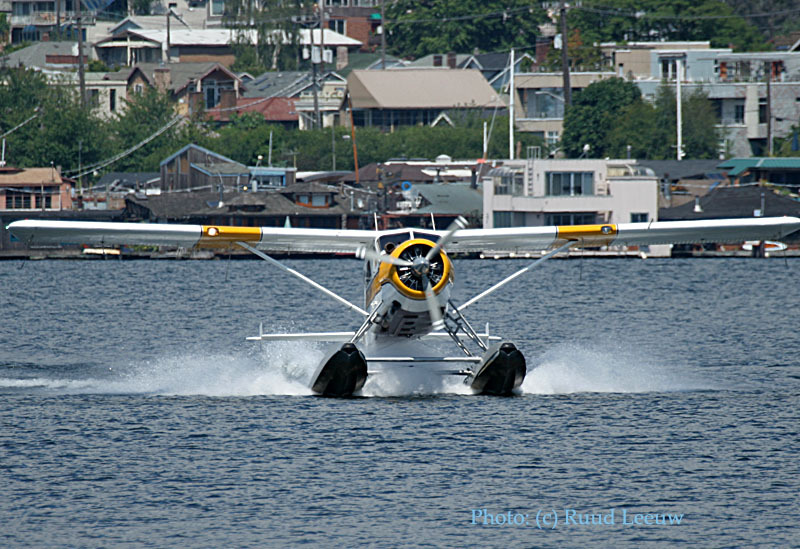 The three-bladed prop and the additional windows are obvious signs of a modified DHC-2 Beaver. 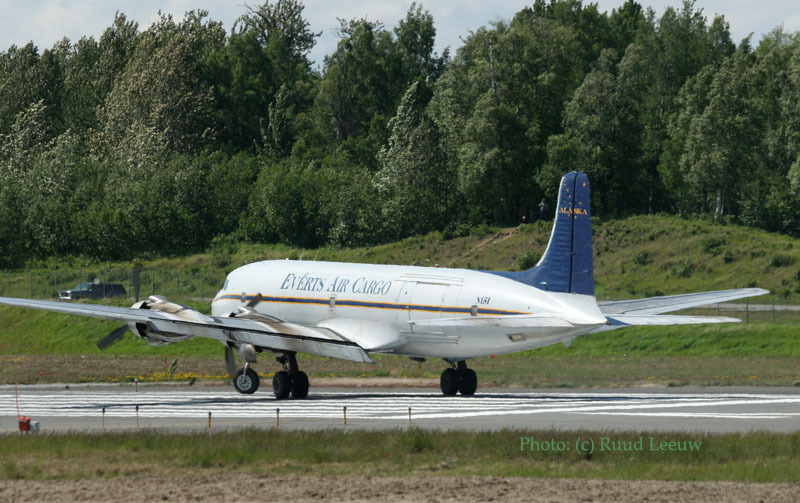 Douglas DC-6B N151 (c/n 45496) of Everts Air Cargo lines up for take off on runway 14. This DC-6B used to fly with Conair as C-GICD, but was registered to Everts Air Fuel on 05Sep99. of ACE's fleet. 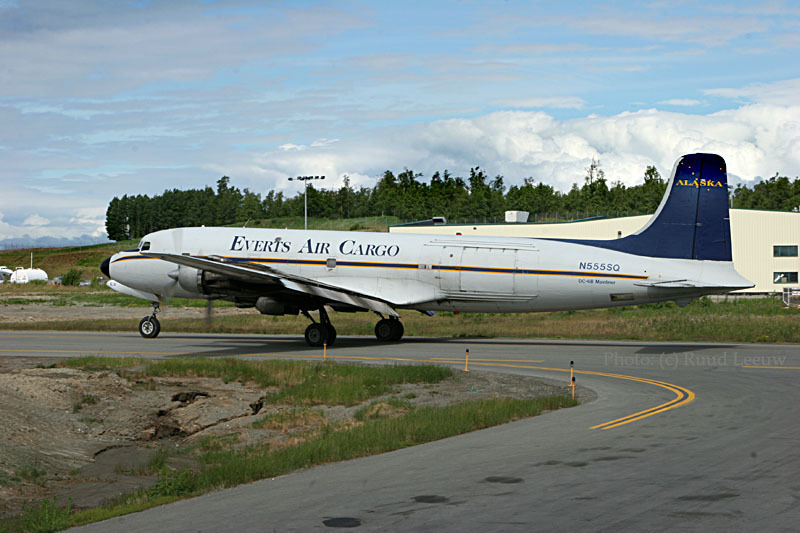 ACE was renamed Everts Air Cargo in 2002. 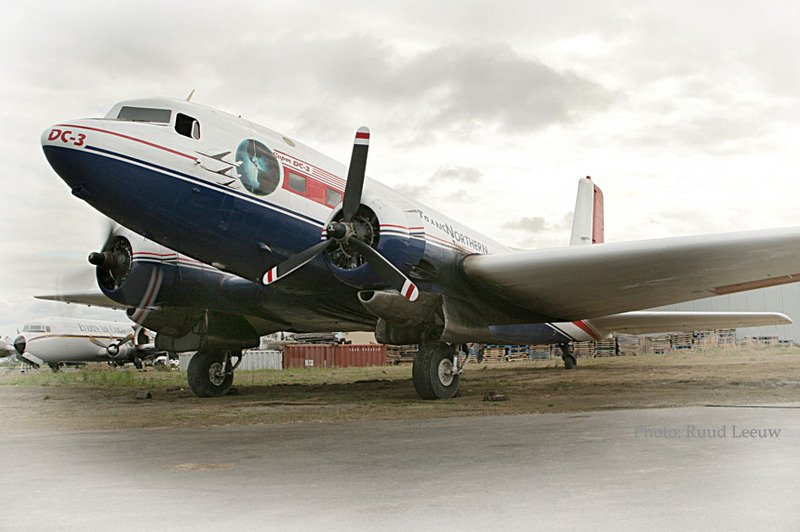 This humongous beast of a plane is one of my favourite Skytrucks: the Curtiss C-46 Commando. This is C-46R N7848B (c/n 273), which I had also come across in 1995. In 2001 I learned this aircraft did a yearly production of about 750 flight hours; but business seemed to be booming with Everts, maybe they get more business from her now. However, considering its age and the rarity of its type, its mere survival in a commercial role is a miracle ! Since my previous visit in 2003 they moved around the storage part of the airport; so these survivors ended up here: cliffhangers? What will be next for them. 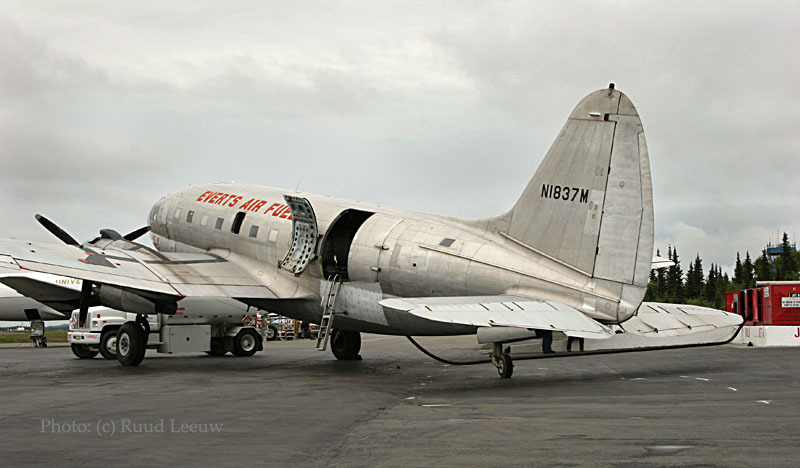 The DC-3 is a Douglas C-47A, tailnumber N67588 (c/n 20536); you can see its tail has been damaged. I wrote about its history in my 2003 report. When I checked ATDB.aero database in Aug.2012 it was marked as 'destroyed'. No date. It is former USAF 53-8073. Classic Air Transport (a company I would welcome more info about) bought it in August 1995, but I don't know if they actually flew it. Roger Brooks of Brooks Fuel bought it in 1998, but it never made it up to Fairbanks. How much longer will it survive? 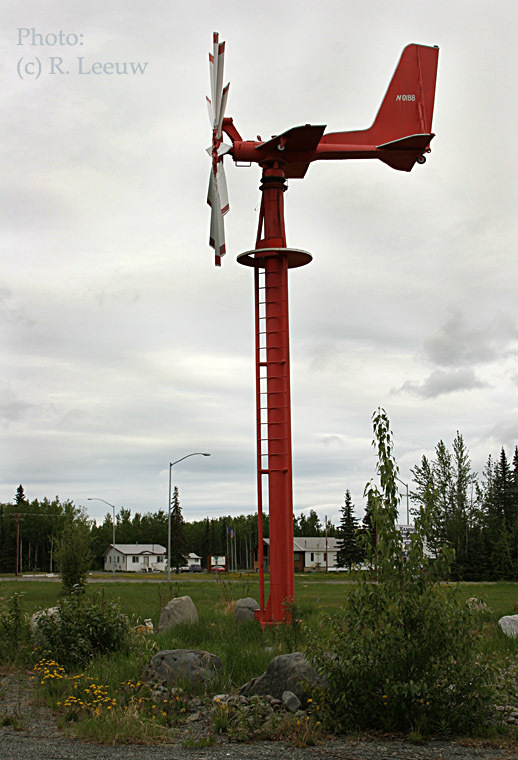 In 2018 I learned that Roger Brooks had donated it to the Alaska Aviation Museum, where it one day may be preserved and displayed. "I flew mostly out of Anchorage from 1977 to 1984. In particular, the C-119 Boxcar N9027K was one of the airplanes that got my attention. 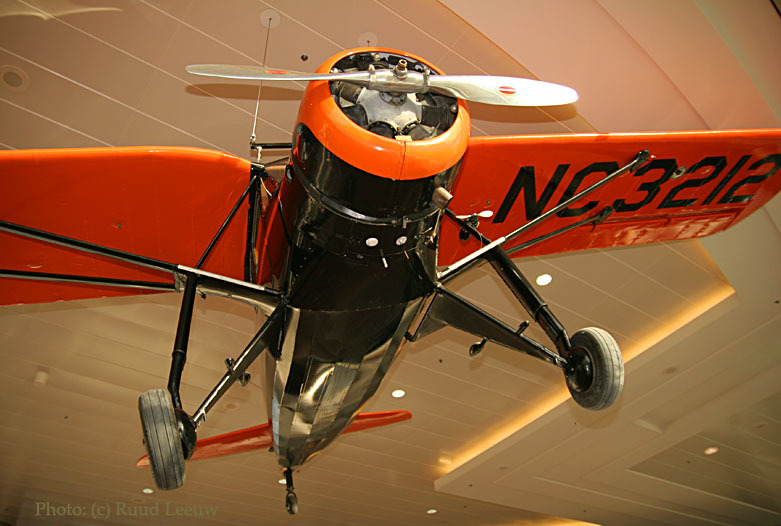 In the summer of 1982 I flew that one, along with 5 others, that belonged to Jack Gifford's Flying Service. Late in the season, I was departing Dillingham at about 3 am for ANC. We used to carry up to 24,000 pounds of fish, but we only had about 18,000 this night. It was September, so it was dark at 3 am now. The 30 inch check on run-up came up just a wee bit short of the 2600 RPM that is supposed to show at 30 mg... But it was close. We had fire bottles on those. It's also incredibly loud at takeoff in a 119, even with one in feather. It climbed, but not much. Went downwind at about 300 ft. I knew the airport well enough to make a visual turn to a rounded base leg. Rolled onto a short final but couldn't see the runway. There is a river on short final so I knew right where I was but couldn't see the runway. Ken and I spotted it about the same time, and I was not lined up exactly right. Ken says better go around. No way! I skidded it over, called for gear down, was in the flare, nose gear still up, said don't worry about the nosegear Ken we are gonna live.., and right as the mains hit, the nose wheel came down and locked! Made the first turn off. The Boss was there. He said nice job, but I have one question. I asked what? He said how come you didn't use the Pilot controlled runway lights here at Dillingham that were installed last year? Dunno boss, I never flew here at night. I had made the take off without runway lights before so I wasn't too worried about the TO. But it sure would have helped to land!! A quick look at the ramps surrounding Lake Hood; I found Beech 18 N255D here. N255D is a Beech E18S (construction number BA-16) and was registered on 19Feb04 to Alan G.Foster of Anchorage,AK. It was built in 1954 and still holds its Airworthiness Certificate of 14Nov55. I would welcome more details on its history. "I see that you are looking for info on Beech 18 N255D. This plane was owned by Merchant Bank in Indianapolis in the late 1960's. The bank owner, Otto Fressell (not sure of the spelling) used it to bring customers up to Charlevoix,MI for many years. 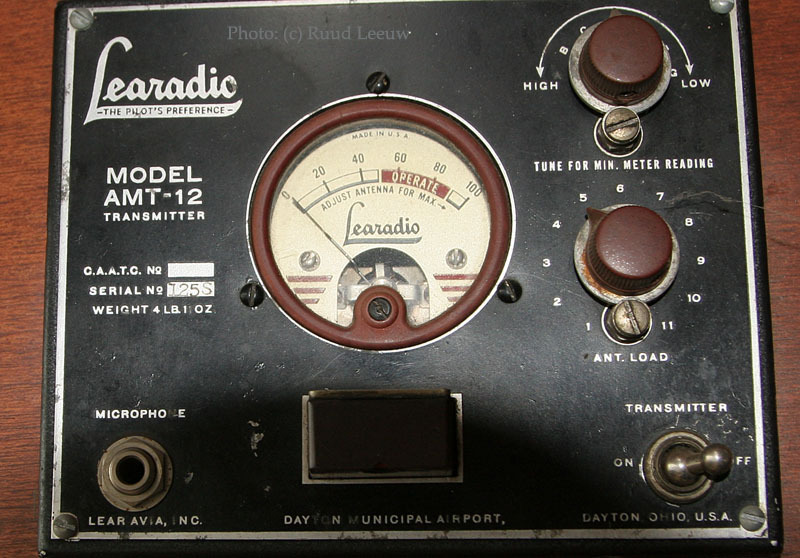 Bought by Roscoe Turner Aeronautical Corp, Indianapolis,IN 02Nov54. Stokely Van Camp Inc, Indianapolis, IN 02Nov54 (same date). Back to Roscoe Turner 13Feb60. L.C. Cassidy & Son Inc, BS 13Feb60. Back to Roscoe Turner 03Aug60. Rereg’d N255DC 15Feb62. Merchant’s Bank & Trust, Indianapolis,IN 28Sep62. Rereg’d N255D 19Nov62. Omni Investment Corp 30Sep68. Clanton Air Carriers, Clanton,AL 18Nov68. Repo by Aircraft Acceptance Corp, Columbus,OH on 15Sep70. Robt L. Smith, Birmingham,AL 21Jan72. Repo by Aircraft Acceptance again on 05Jun73. Birmingham Avn Inc, Birmingham,AL 02Jul73. C.O. Williams Jr, Atlanta,GA 31Jul73. Associated Airways, Mayfield, GA BS 14Feb74. Accident 17Apr74 Atlanta,GA: forced landing on arpt on TO (lost power - ignition system poor maintenance) on a business flt. Hit FAA DC-3 N44. 4 uninjured. Sold, unrepaired, by National Independent Insurance Co to Hill Aircraft & Lsng Corp, Atlanta 21Oct74. Bush Aviation Inc, Dania,FL 25Jan80. Allen Fadel 25Feb80. Michael McGovern forfeits it by decree of the Circuit Court of the 15th Judicial District, Criminal Division, Palm Beach County,FL to Palm Beach County Sheriff. Donated to Missionary Flights & Svcs Inc, W. Palm Beach,FL 17Dec80. 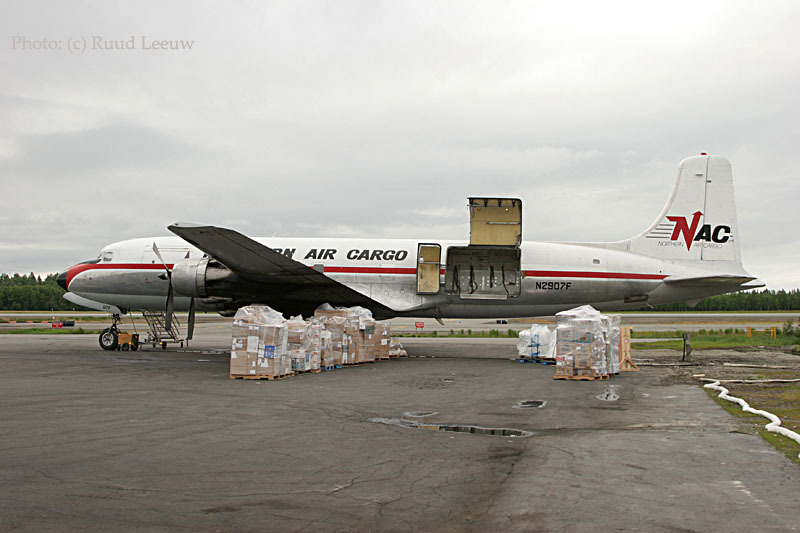 Air Cargo America, San Juan,PR 07Jun83. 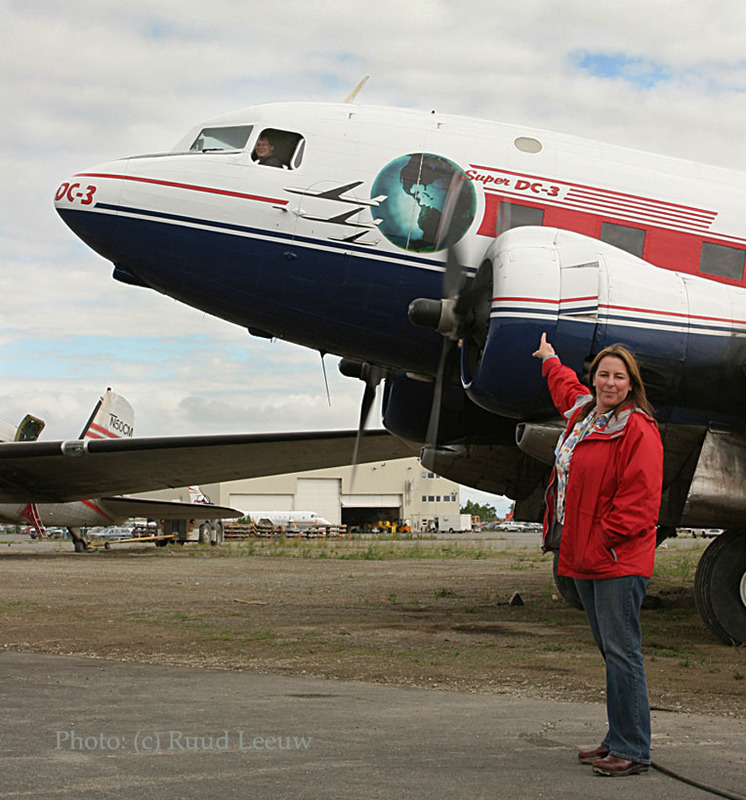 Photographed with Air Cargo America titles & 'Miss Julia' on nose. James R. Bell, Miami,FL 22Dec83. Cargo door & cockpit pilot door installed 07Jun84. Aaron Pirani dba Mangalji Airways, Miami,FL 03Nov89. Aaron Pirani Mangalji Airways/Eagle Wings 03Nov89. Seen in 'Eagle Wings St. Lucia' + 'Miss Erika'-titles at Miami in Nov89-94. Eagle Air Charter Inc, Miami,FL reg’d 11Sep96. South Florida Aircraft Lsng Inc, Opa Locka,FL rgd 22Apr99. Alan G. & Susan K. Foster, Anchorage,AK reg’d 19Feb04. 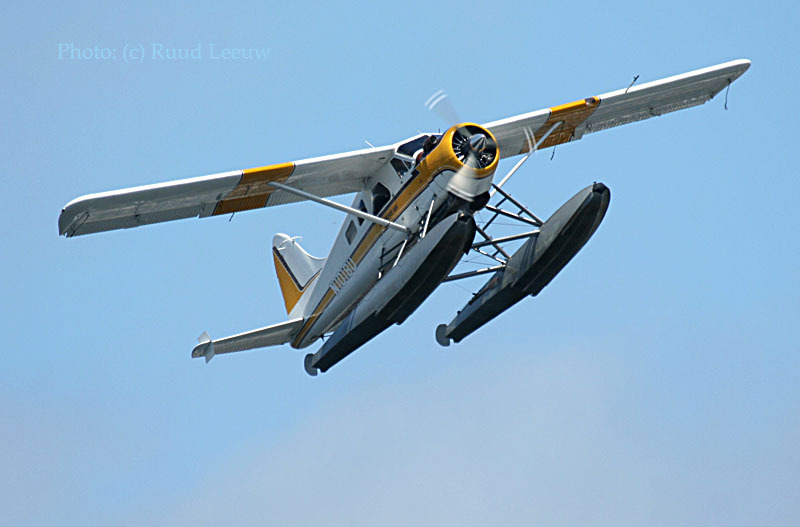 Driving around Lake Hood one will see a few interesting floatplanes (a.k.a. seaplanes) sitting dry. 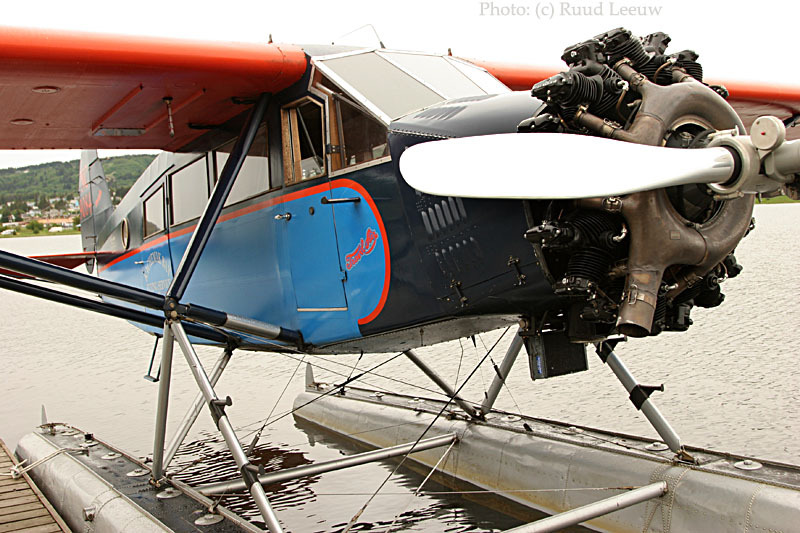 The DeHavilland DHC-2 Beaver may be the most famous of bushplanes, but the Noorduyn Norseman stole my heart... This is N225BL (c/n 542) and I hope it will get its feet (uhmm... floats!) wet in other ways than sitting out in the rain! 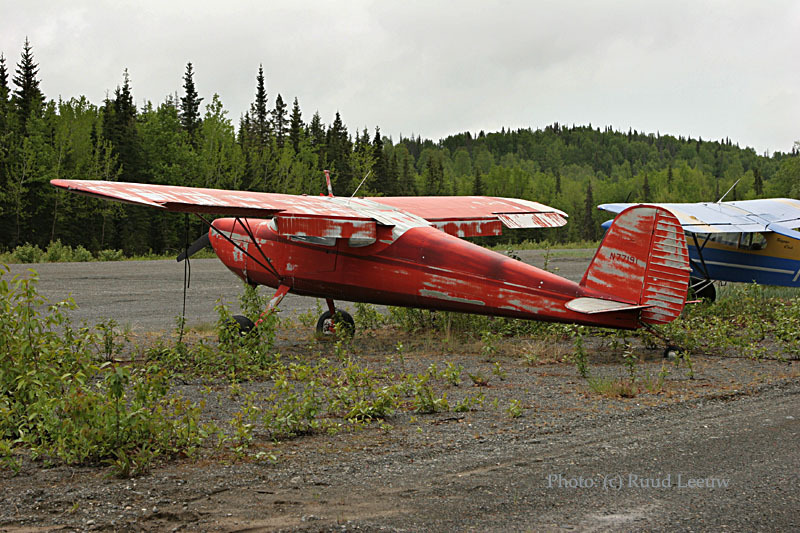 The FAA Registry has the following info on this UC-64A Norseman: "Registered 27Jan04 Thomas J.Gayer & Steve L.Ingram, Cooper Landing,AK; manufactured 1943". Kyle Cameron wrote: "That airplane was most definately C-FGUE of Northway Aviation out of Manitoba. Sometime in the 1980s it passed through Whitehorse enroute to Alaska as it had just been sold." 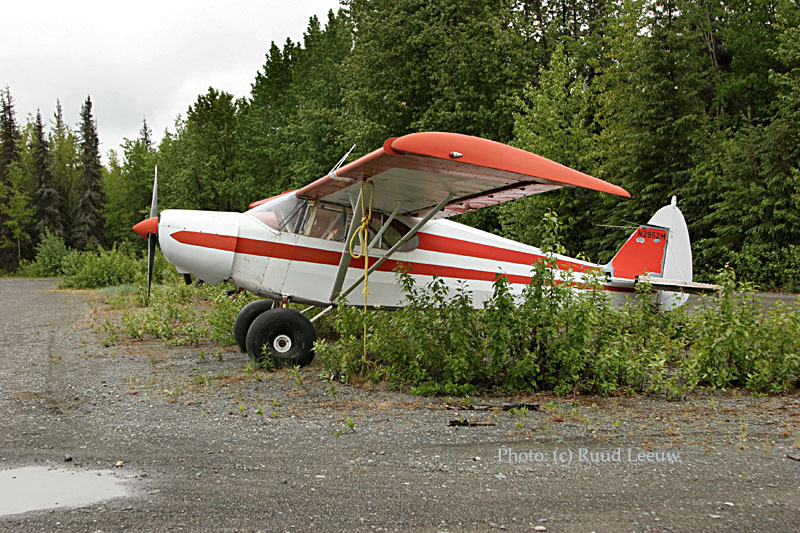 Kyle also found Ken Stoltzfus' webpage on N225BL, with an extensive report on this fantastic bushplane. Ken's report dates from 2004 and lists N225BL as owned / operated by Steve and Diane Ingram, of www.ingramsbasecamp.com; when I checked, Steve confirmed their ownership, but this beauty is for sale. 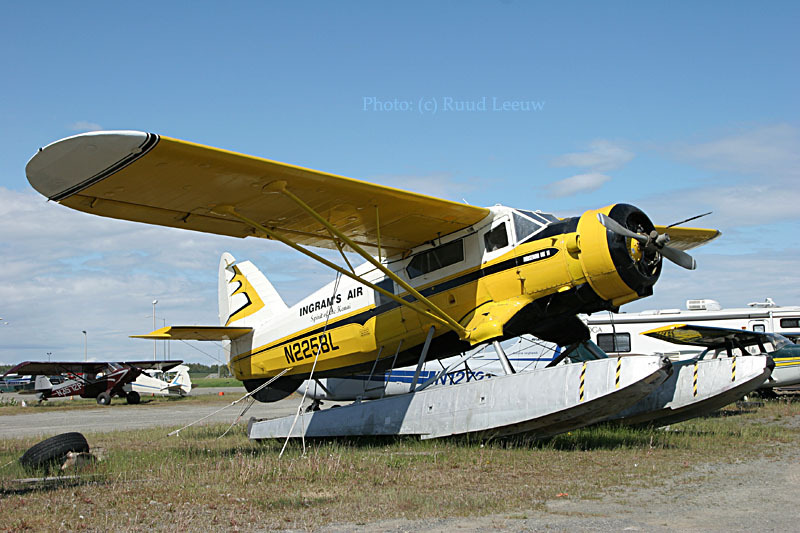 In 2008 N225BL was sold, as reported (including photo) by Martin Prince Jr.
And Martin saw it operational, at Bethel, in August 2008! 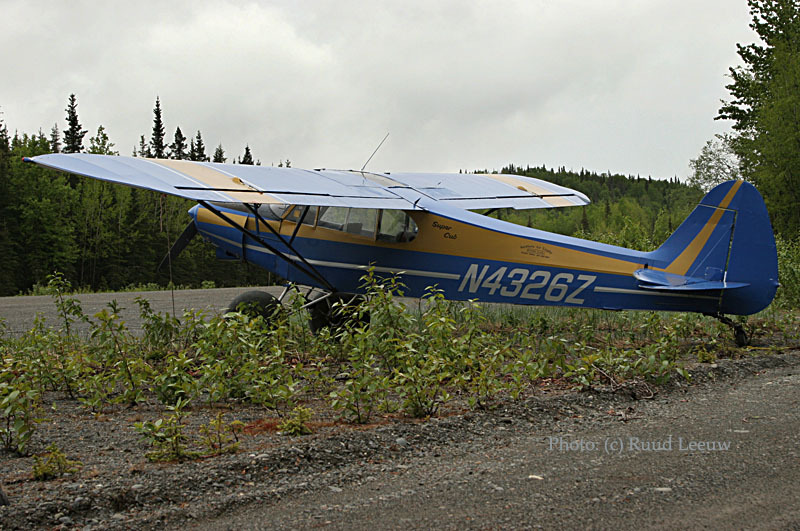 N225BL suffered substantial damage on 11Jul09 when its engine failed and a forced landing needed to be executed at Akiachuck Village (near Bethel,AK); the pilot did not suffer any serious injuries. In 2016 I came across a note that it was being rebuilt by Jeff Brooks. Photos on www.aerialvisuals.ca/AirframeDossier.php?Serial=2961 show scrapped remains in open storage at Bethel in 2016. In May 2018 it was confirmed to me by local Bethel resident, JoeJoe Prince, that those remains are still there. I did find a part, with CF-GUE registration on it, at Yanks Air Museum in april 2018; perhaps that was the only thing they could use of N225BL for their restoration of a Norseman..? There is of course this wonderful museum, but I did not have the time to visit it. I did visit it in 2003. So after that quick visit to Anchorage and Lake Hood, we continued to the Kenai Peninsula, final destination Homer. But on this fine saturday, june 10th, I could not resist having a quick peek at Kenai's airport. I saw 3 fine propliners here. Universal Airlines: this company had eluded me when I tried to find them on the US Eastcoast last year, overlooking the fact that they had moved years ago to a new homebase in Victoria, Texas. But they have a tradition of being here on contract all summer for fish-hauling flights. 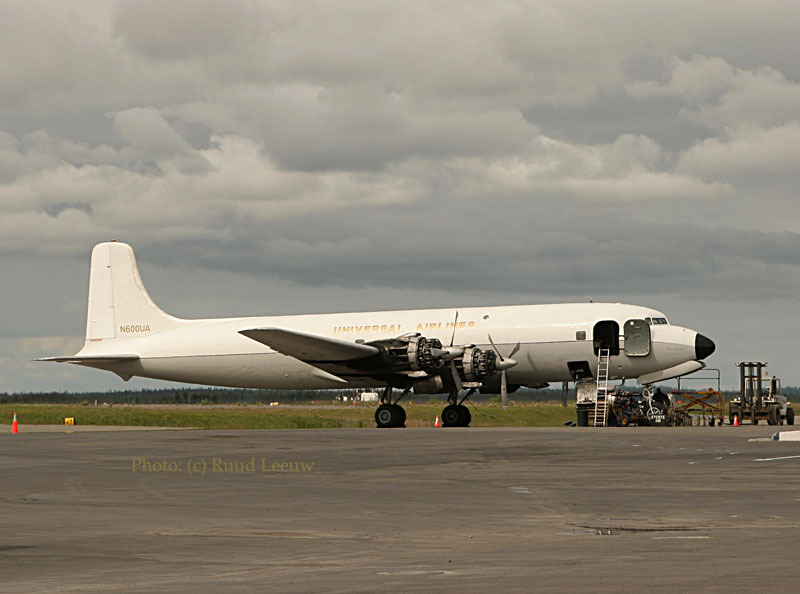 This is N500UA, a Douglas C-118A with c/n 44597. Obviously some maintenance is going on here, not too bad on a day like this; but I am sure they done it in much worse weather (out in the open too). More on its history can be found on a page dedicated to a return visit to Kenai on June 12th, 2006. N600UA is a Douglas DC-6B (c/n 44894) of Universal Airlines; it also sits with the cowlings removed, for maintenance access to the engines. 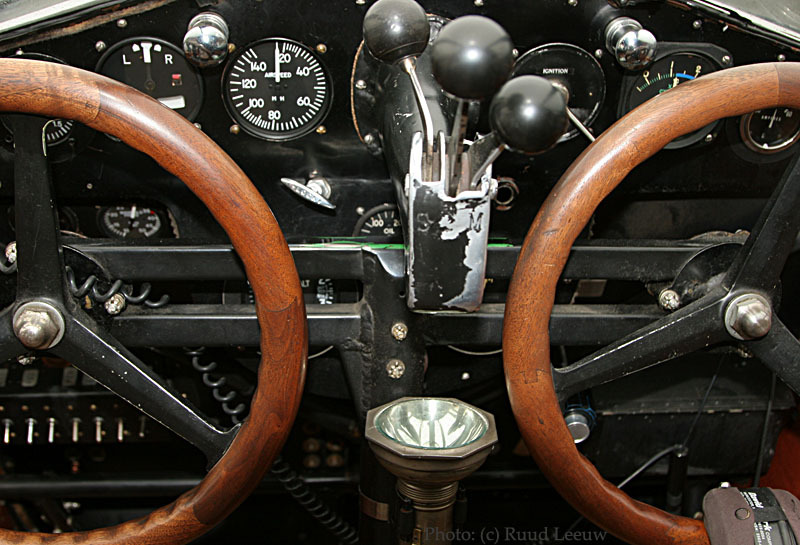 It is great to see 'Vintage Aviation' continue in an active, commercial role to this day! 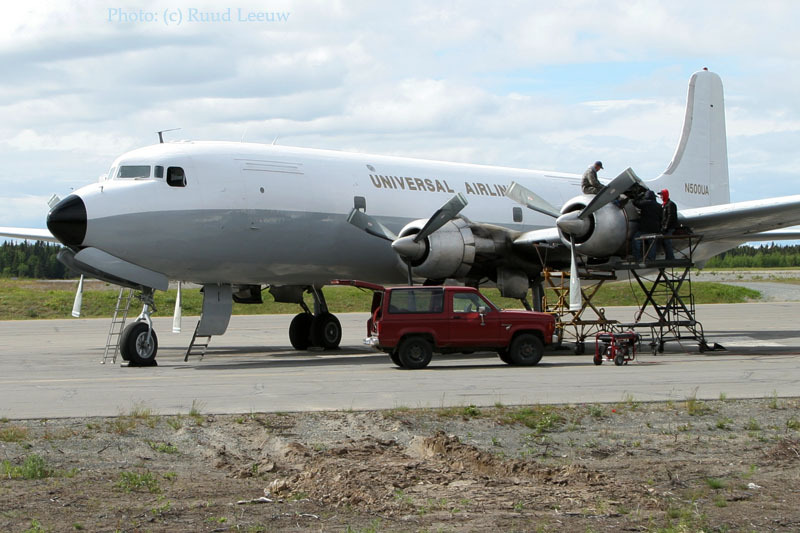 John Maxwell sent me a photo, in June 2011, of N600UA involved in a wheels-up landing at Cold Bay HERE..
Everts Air uses several of these, they operate the largest fleet of these magnificent Skytrucks. N1837M is used for hauling fuel to the many remote communities throughout Alaska. 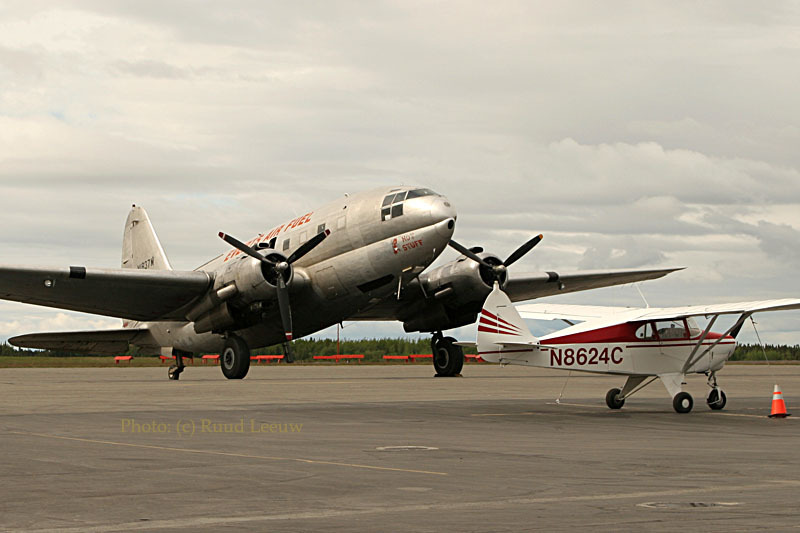 And Kenai seems to serve as a homebase for this plane, nicknamed "Hot Stuff". 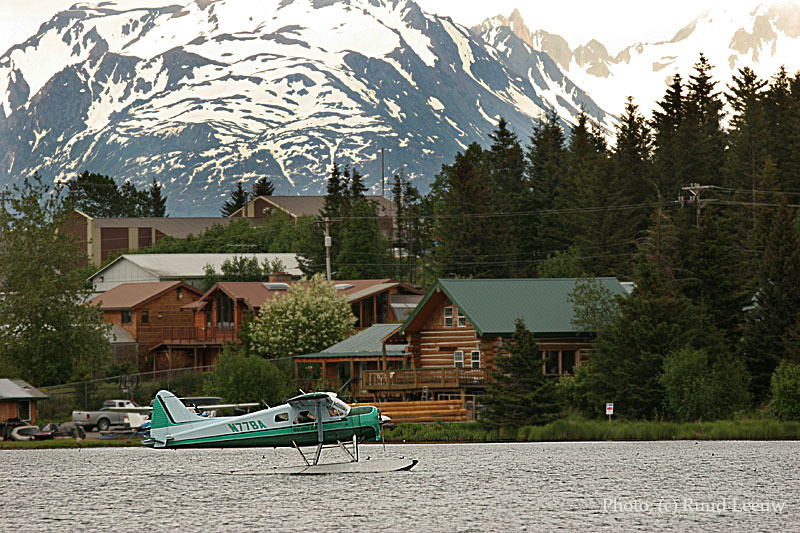 Another good reason for visiting Homer is doing a flightseeing trip with Kachemak Bay Flying Service! Bill de Creeft has a vintage 1929 Travel Air S6000B on floats (NC9084) and we enjoyed a unique trip on board his classic bushplane: it is an exhilarating experience to fly in a 1929 airliner in such superb condition! Note the correct spelling here is 'Curtiss-Wright"
"I am thinking of retiring, and of selling the Travel Air either this year or next. If you know of someone who would be interested: let me know... but it will not be cheap !! I have for it an original Wright Whirlwind from the the late 1920s or early 1930s... one that used to be operated by Reeve, and was overhauled and set aside by him and has never been run since. So the plane would be very original with a complete history and with the 1934 EDO floats and the 1929 skis. I have removed the constant-speed propellor and reinstalled the original ground-adjustable Hamilton Standard prop. That is the way I operated it for 30 years! I'm glad you came here and rode in it, especially if I quit flying... I have just taken my flight physical and am good to go another year... but I am ready to take it easy; I will be 75 this summer ! Let me hear from you if you have any ideas of collectors or museums. It is, of course, in perfect flying condition." NC9084 was sold in 2008 and registered on 24Nov08 to Pole Pass Airways Inc of Seattle,WA. 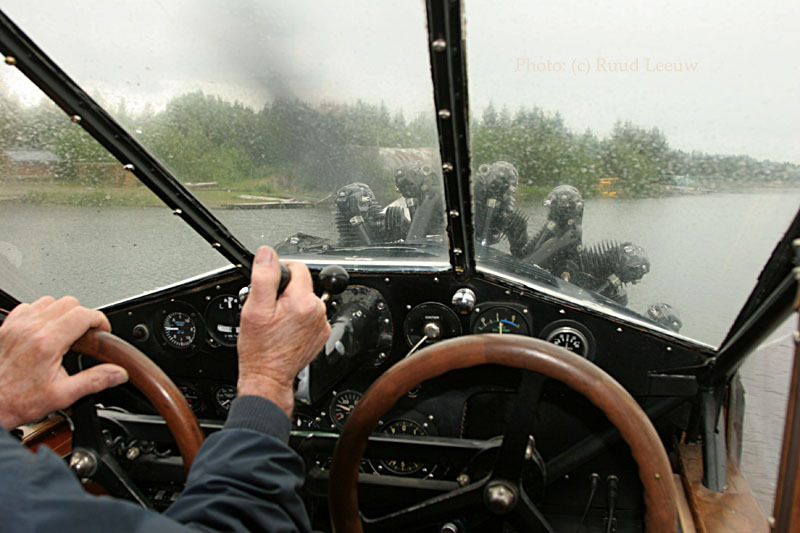 Bill de Creeft converted his office-on-the-lake to an aviation-themed-cabin-for rent. 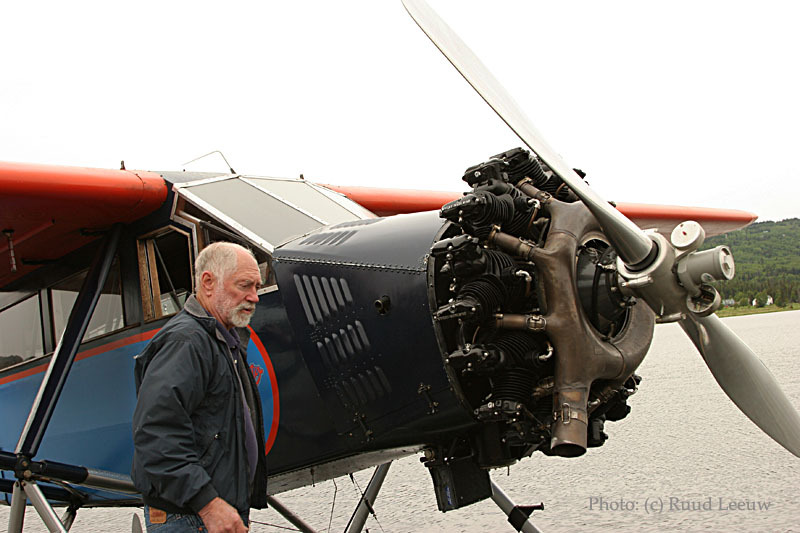 Bill now flies an Aeronca Sedan (May 2010). He left a message: "We no longer offer Scenic Flights, but you can contact our son, next door, if you desire a flight over the glaciers or need other air taxi services." Jim Rearden wrote a very interesting book about this plane, titled 'Travel Air NC9084, the history of a 75-year-old working airplane'. (Pictorial Histories Publishing Company, ISBN 1-57510-105-X, 2004). A more complete airframe history will be hard to find! Nice reading, too. From another book (Mudhole Smith, Alaska Flier -Lone E.Janson, 1981) I learned the going charter rate for the Travel Air operated by Cordova Air Services in 1941 was 45 US dollars an hour. 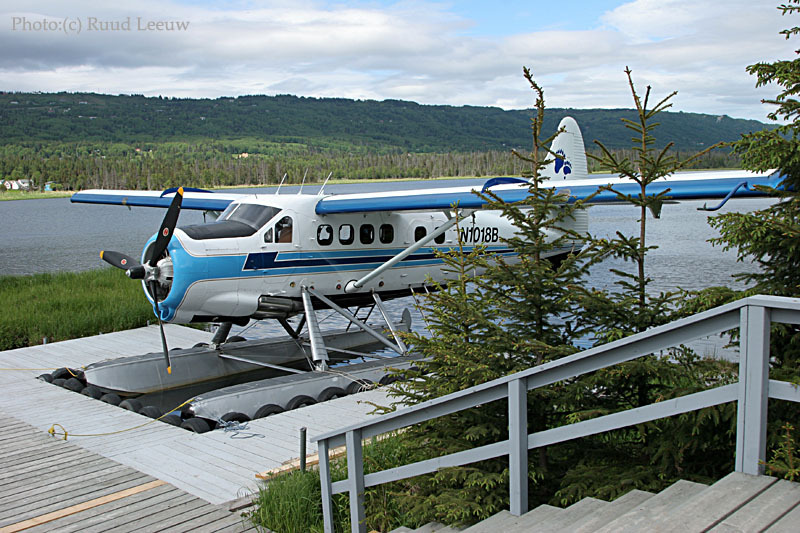 Flightseeing, bearviewing and fishing trips create their own industry and Homer has a few companies based here on Beluga Lake, targeting these markets. Another operator is Bald Mountain Air; they are all neigbours of each other and operate to a variety of destinations or one of your choice. 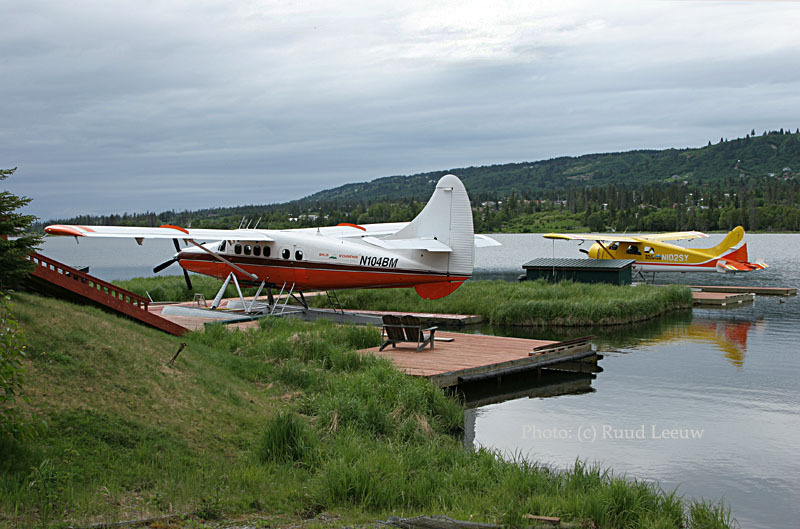 The one on the left is a Turbine-modified DHC-3 Otter, while on the right is a DHC-2 Beaver. N104BM has been modified by a turbine engine. 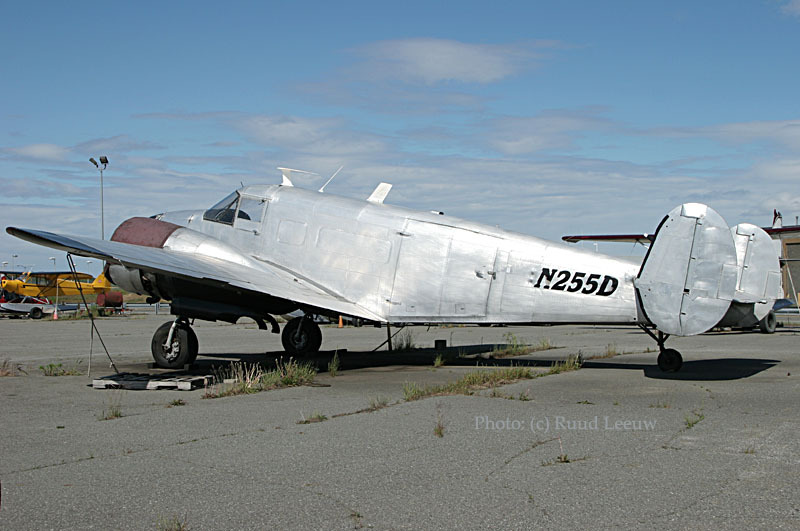 C/n 118 was registered to Jeanne G.Porter (Homer,AK) on 17Apr01, while having been built in 1956 and its present Airworthines Certificate stems from 01May01 (probably the date of the turbine engine conversion). Here is a company that does these kind of modifications: Texas Turbines. This is DHC-2 N102SY, c/n 1367. Like so many it to started with a military career upon its deliverey on 08Jul59 as 58-2035 to the US Army. Some 12 years later it was stored at Davis Monthan AFB, 05Feb72 to 19Jun75. Its civilian career started as N102SY for Syanon Foundation of Marshall,CA but I have no date for this. It was reported on 01Oct82 at Youngstown,OH. Owners (but no dates) included Henry Braun of Pasadena,CA and Everbrite Electric Signs Inc. (Greenfield,WI). Jeanne G. Porter of Homer,AK saw it registered to her name on 15 April 1994 and this is still current. On 07Dec07 it was registered to Ptarmigan Air of Bethel,AK. deHavilland Beaver N77BA, homeward bound. This is so Alaska, don’t you think…? We see N77BA (c/n 1549) here taxying in on Beluga Lake, Homer. It seems to have been delivered on 10Jun64, but to whom? It became N77BA on 27Jun84, for Jon M. Berryman of Beluga Lake Floatplane Service, Beluga Lake, Homer, AK and this is current to this day (Nov06). Its Airworthiness Certificate stems from 02Jul84, so I guess it was rebuilt before then. We drove a different route to Kenai on our return, which we thought would be a scenic drive: Kalifornsky Beach Road. But the coastline is of course prime real estate, so you have privat grounds between the road and the sea, nothing much to be seen or enjoy. I did find these bushplanes, on a gravel strip. I returned to Kenai and this time I was allowed on the ramp, where I had ample opportunity to photograph the aircraft and talk to the groundcrews. I also met the flightcrew of N1837M 'Hot Stuff' very briefly: they were rushing to make a departure for another fuel delivery flight. 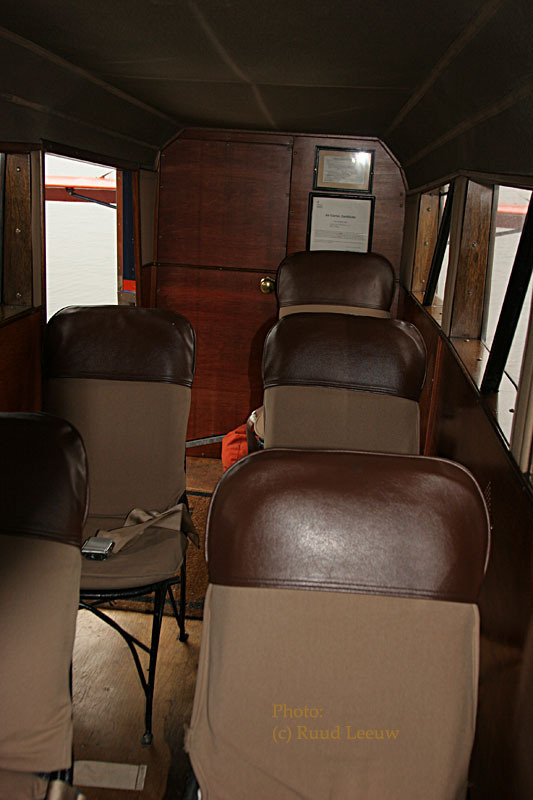 I made a seperate page on this visit to Kenai, please follow the link; there are also interior photographs of cockpits and cabins. 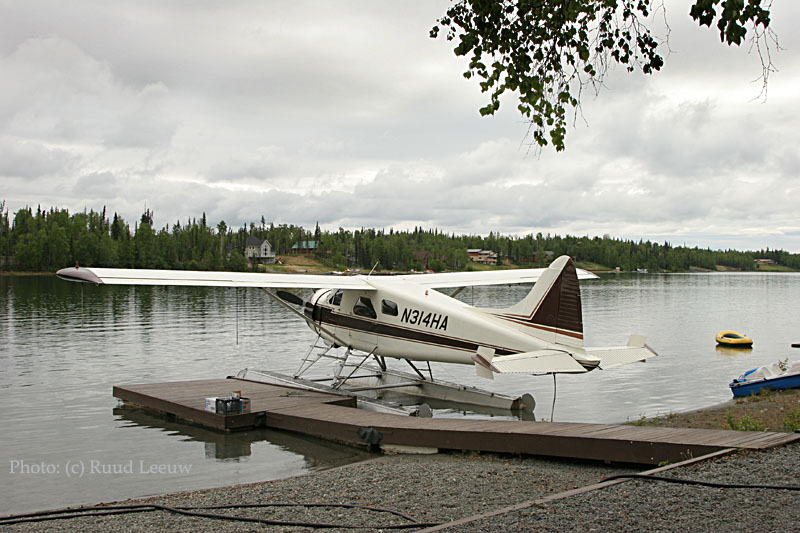 After leaving Kenai I looked for a turnoff for Mackey Lake, which was supposed to have floatplanes as well, but I missed it. Instead I found Lake Ellesmere where I knew High Adventure Air would be based and indeed found N314HA in between assignments. Again I enquired for a bearviewing trip, but a few disappointed fishermen in the office confirmed the salmon run hadn't started yet. And no salmon: no bears... So my catch of the day remained limited to N314HA: things could have been worse! 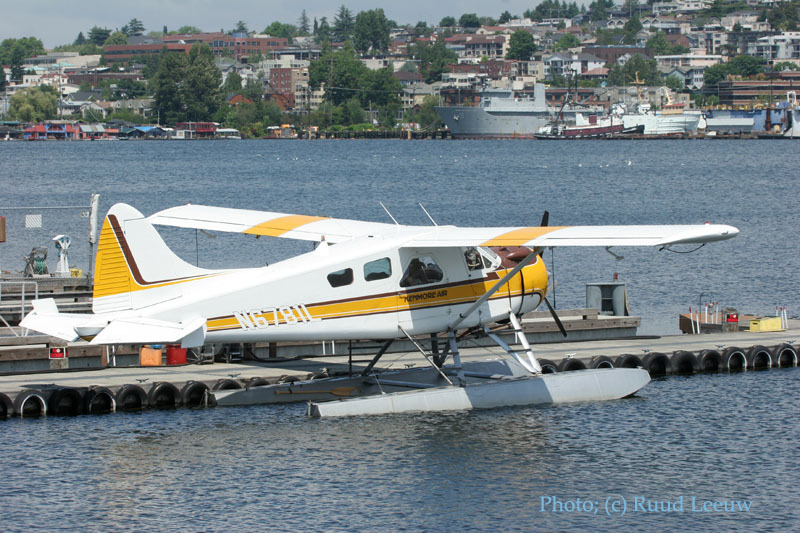 This DHC-2 Beaver started life 10Feb56 with its delivery to the US Army as 54-1720; this number is still quoted as its manufacturer's serial by FAA's N-inquiry website. But its actual DeHavilland construction number is 868, a mistake commonly made on FAA's registry. Now, what is this ?? Something with a prop and that makes me stop and have a closer look. registration has to start with a number 1 to 9). Funny and remarkable all the same. We continued our way back to Anchorage. One more day at Anchorage, only one more day... My brake-neck-itinerary would dictate a flight (one of eleven on this tip) to Juneau the following day. But one more day at Anchorage, where hospitality hasn't vanished because of the required additional security measures. A company favourite among the favourites is Transnorthern, which operates charter air service with various aircraft (Beech 99, Fairchild Metroliner III and DC-3's). 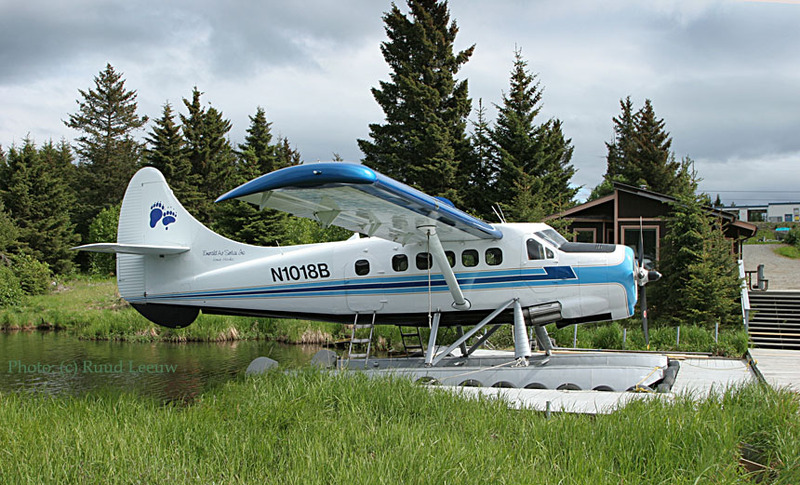 Transnorthern operates thoughout the rugged Alaskan environment on contracts with lodges, charters, etc (both passengers, cargo and combination of these). I had met Andrea on my previous visit in 2003; she is co-owner of Transnorthern, together with her husband Alan Larson. Nick Oppergard, who had shown me around in 2003, left shortly after in a bitter seperation. Andrea took me to N30TN, of which she is justifiable proud! Their C-117D (c/n 43159) needed to have both engines testrun and I considered myself lucky to witness this. The photo on the left has no.1 running and all went well. 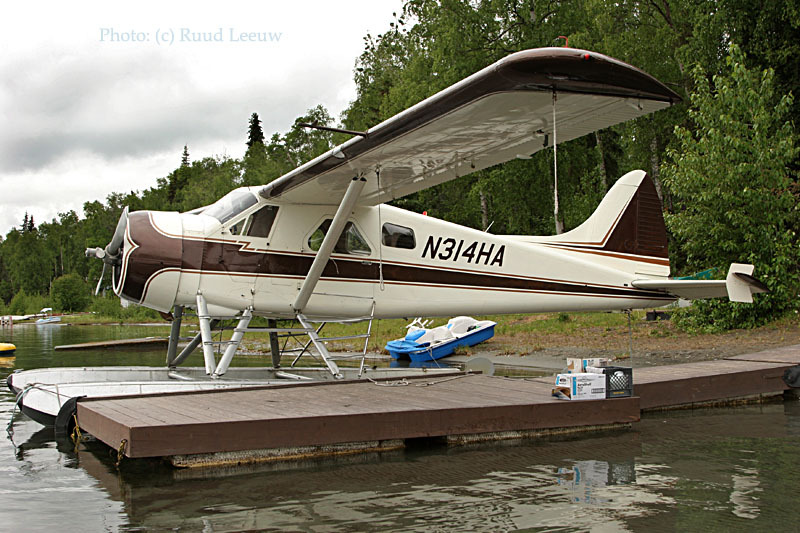 See more of N30TN (and other aircraft) on my Anchorage 2006 page. 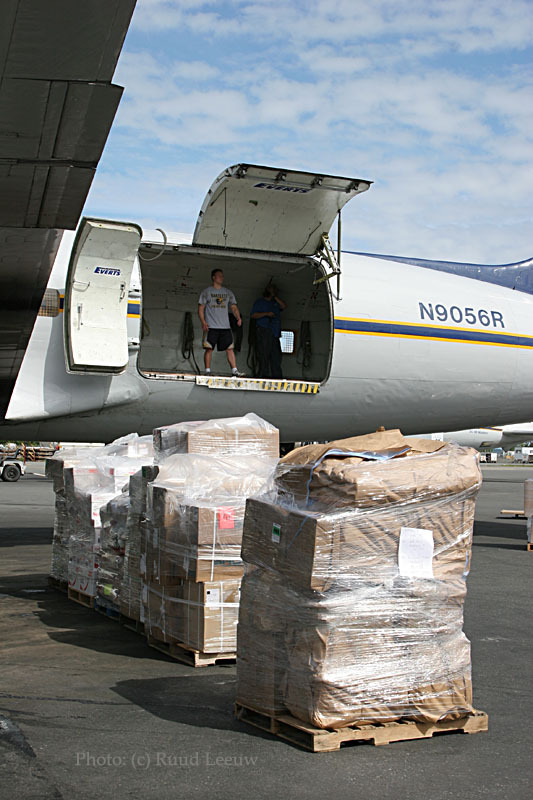 The history of Northern Air Cargo's N2907F has been written out on my Alaska 2003 page. 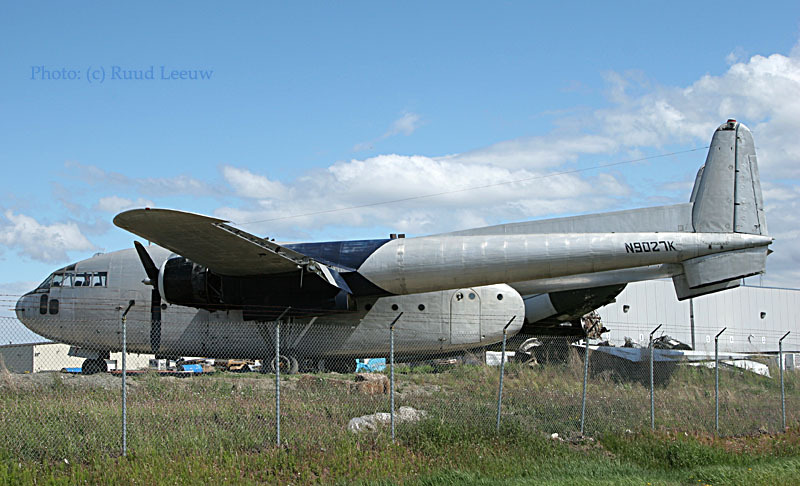 It is a former military Douglas C-118A (c/n 44636) which started its career on 21Apr55 as 53-3265.
probably be scrapped, while N6174C has some 3.500 hrs before its major check so it a good candidate for continued service with another owner. 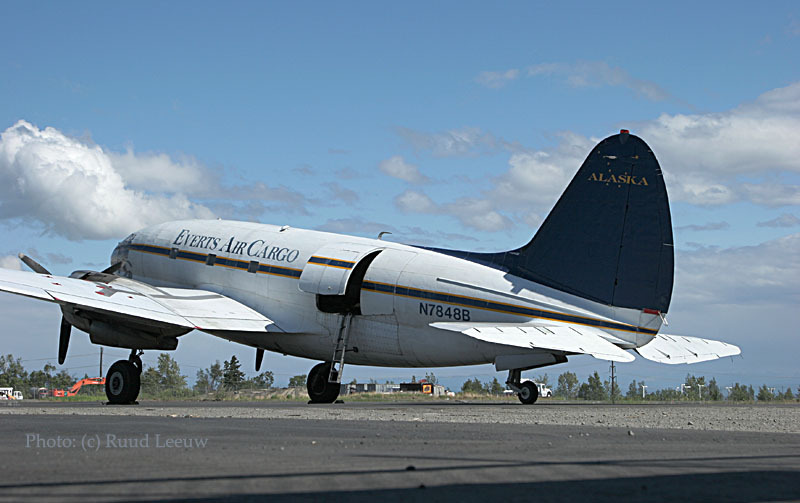 Other than DC-6A N6174C, none of the DC-6/C-118 aircraft recently sold to Everts by NAC will fly again. They are all time-expired Part 121 aircraft and the deal stipulated that they would not be flown as Part 125 aircraft. 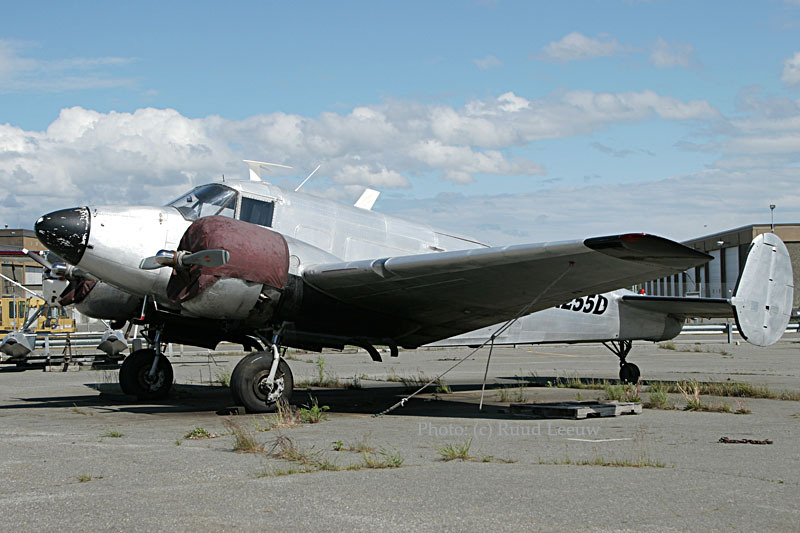 I found NC3212 (N3212) still current on the FAA's Register; this Fairchild 24G (c/n 2933) has been registered to the Alaska Aviation Heritage Museum since 06Jun91. 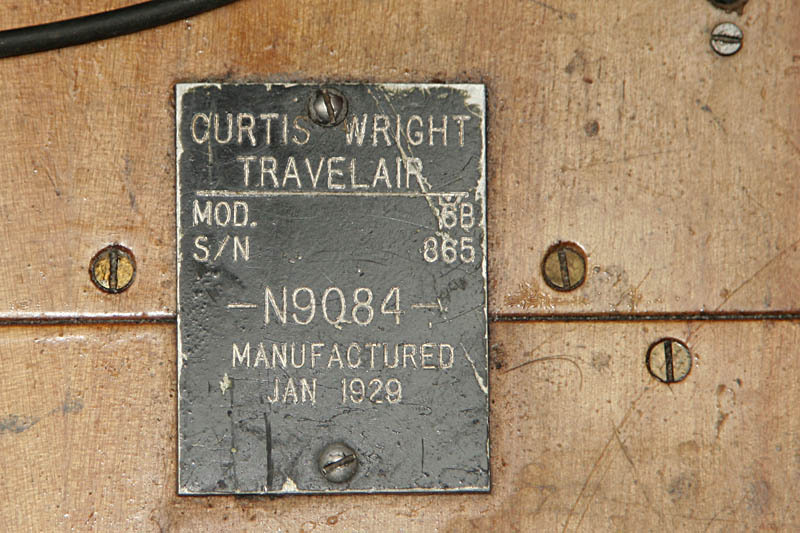 Its year of manufactring is listed as 1938 and its Airworthy Certificate is dated 29Jun56. I suspect it is on loan here (with its flying days over, except from this ceiling..) to either the airport or Alaska Airlines, where I saw it in June while I boarded my flight to Juneau. Alaska Airlines will celebrate its 75th anniversary in 2007. 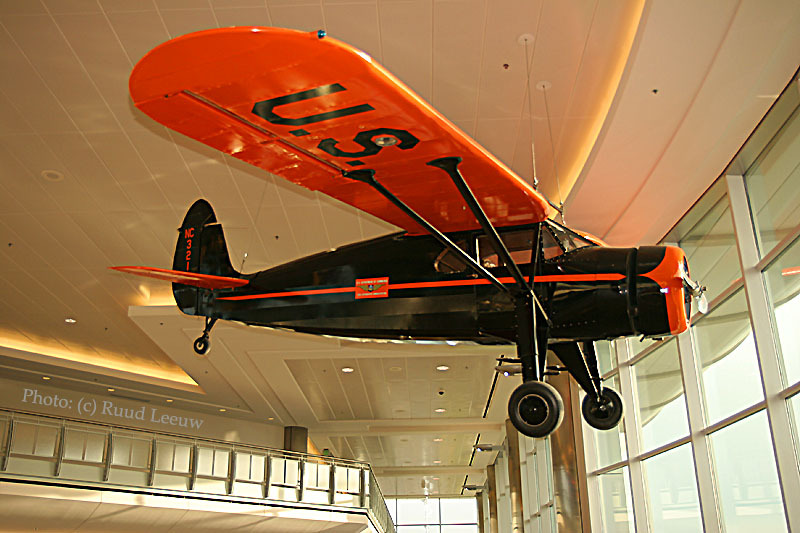 The carrier traces its roots back to 1932, when Linious 'Mac' McGee of McGee Airways started flying his three-seat Stinson between Anchorage and Bristol Bay, Alaska. A merger with Star Air Service in 1934 created the largest airline in Alaska, which eventually became Alaska Airlines. When I had checked into my motel in Juneau I noticed I could see the descending seaplanes (a.k.a. floatplanes) in their approach into town; I photographed some of them with my long telephoto lens, inspite of the considerable distance. This is DHC-2 c/n 1031 with tailnumber N92AK. C/n 1031 was delivered on 29Jan57 as 56-0356 to the US Army. It was entered into the civil registry as N333CD in 1973. Ten years later, Sep83, it was reregistered as C-GNFR for Rog-Air Ltd. of Port Loring,ONT. Fate struck a blown when it hit trees during take off on 23Jul88; the tailnumber was cancelled in May 1989 and it was reported written off. 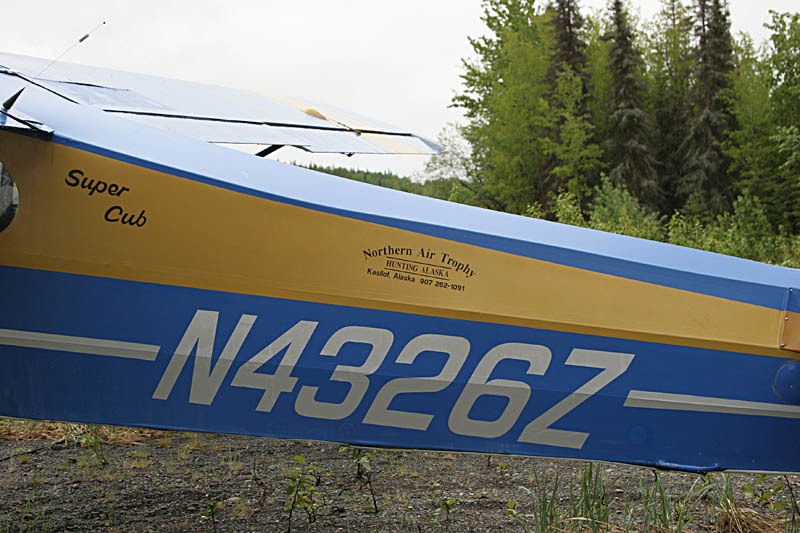 N92AK became the tailnumber for Robert N. Jacobsen of Juneau,AK (probably in 1990 as its Airworthiness Cert. was issued 01Mar90) from there it went to Wings of Alaska / Alaska Juneau Aeronautics Inc., Juneau, AK (date?) and since 11Mar05 it has been registered to Alaska Coastal Airlines (Juneau,AK). N338AK is a DHC-3 with c/n262, which was registered on 24Apr02 for Alaska Coastal Airlines a.k.a. Wings Airways (of Juneau,AK); its year of manufacture staes 1990, which I assume is the year it had a turbine engine fitted. 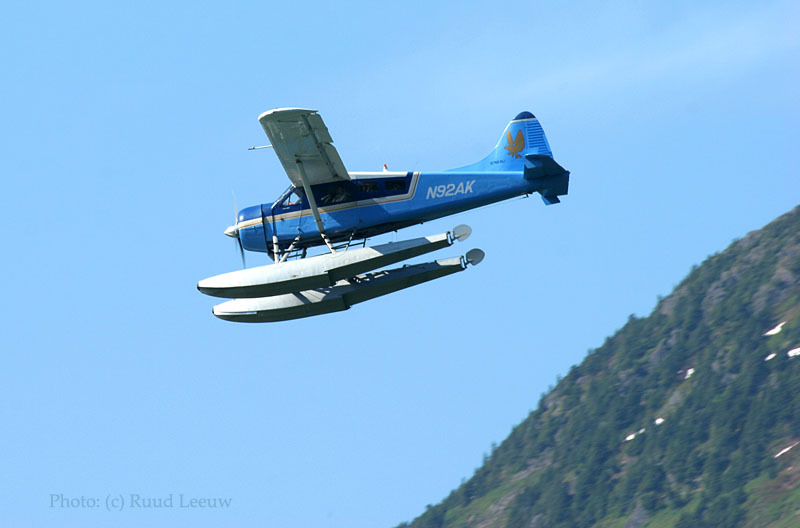 For many more photos of Seaplanes / Floatplanes at Juneau see my Juneau 2006 report. 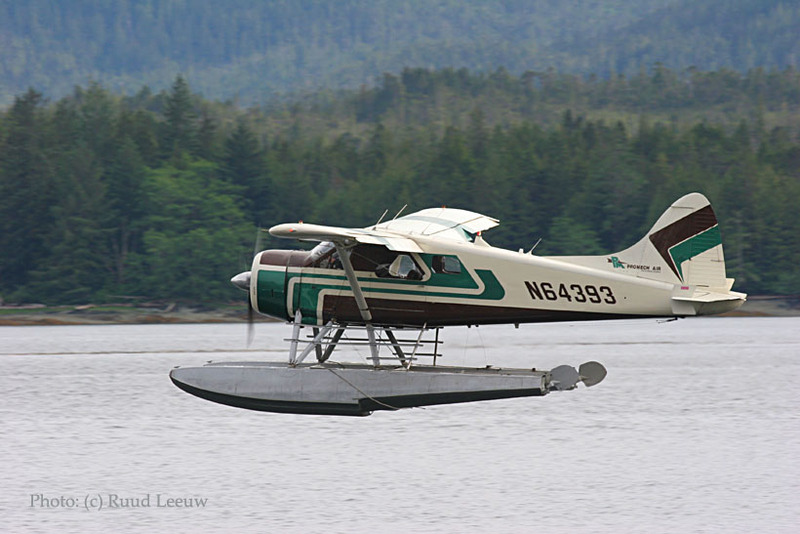 I had kept my eyes open in the town of Sitka, but did not see a DeHavilland Beaver, which I knew had to be there. It was a pleasant surprise when I saw it taxying in while I was waiting for my flight out, at the airport! The history of c/n 1205 starts with its delivery on 14Mar58 as 57-2563 to the US Army; its considerable career ended with storage at Davis Monthan AFB from 20Jun73 to 06Nov74. Tailnumber N62305 for the Technical College of Des Moines,IA was assigned but I have no exact date (1974?). Ownership was changed to Des Moines Independant Commission and in Feb92 it became registered to Wipaire Inc. of Inver Grove Heights,MN. It was probably rebuilt as a new Airworthiness Certificate was issued on 01Mar93, while tailnumber N60TF had been reserved since 30Nov92. Thomas E.McGuire of Anchorage,AK became owner in March 1993. Next was Cinema Air Jet Centre Inc. of Carlsbad,CA but I have no date. And since 06Mar01 Harris Aircraft Services Inc. here at Sitka has owned and operated it. 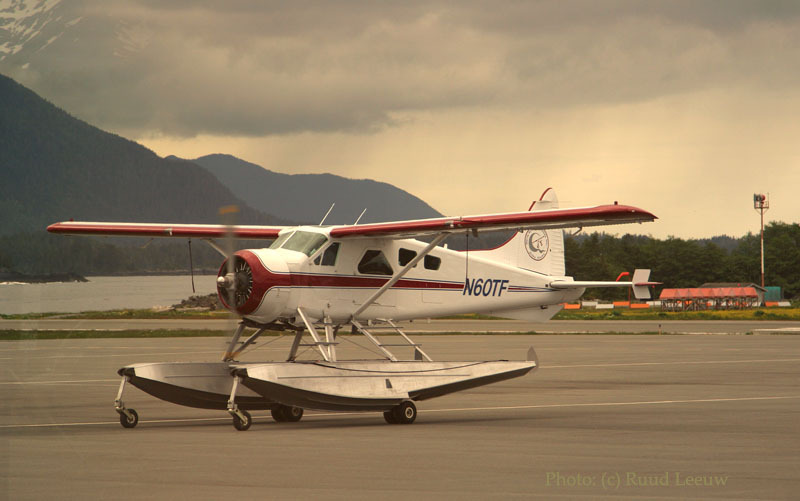 There is a huge business with these planes going, primarly serving the humongous cruise boats and treating its passengers on a quick scenic flight over the surrounding area; Misty Fjords is a prime destination. The Road goes on Forever... into CANADA ! Shaun Lunt (r.i.p.) 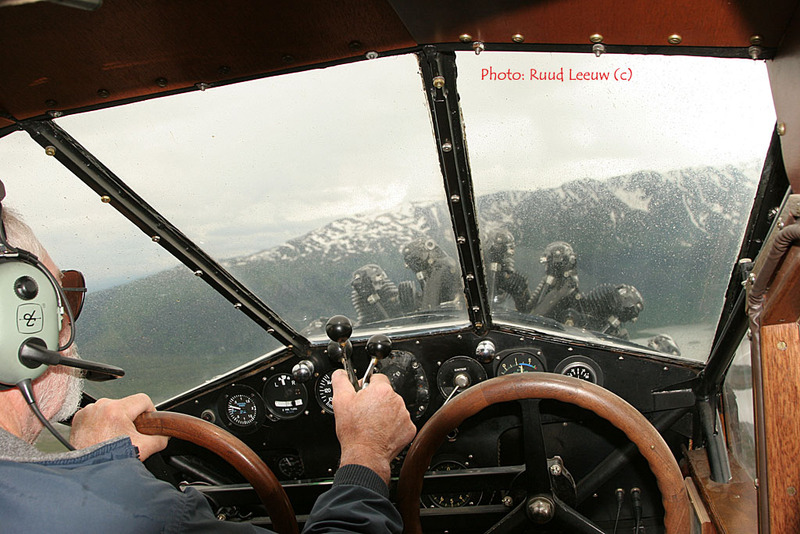 is an Alaskan bushpilot and a fantastic photographer! www.alaskanha.org, the Alaska Natural History Association.